SAS Curriculum Pathways offers over 400 interactives and web lessons for math. Topics range from Numbers and Operations to Trigonometry. Browse resources by category, type, required plug-ins, or level. Each resource includes a short description, estimated time to complete, and appropriate age levels. All activities correlate to state and Common Core Standards. Click the Standards link in each lesson to view corresponding standards for each activity. Create an account to save items to favorites and connect to your school. Generate an account code for your students to create student accounts. Be sure to disable your browser's pop up blocker for this site to allow interactives to load. Use interactives and lessons from this site to supplement classroom instruction. Demonstrate how to use this tool on your interactive whiteboard or projector. Allow students to explore the site independently on classroom computers. Be sure to include a link to activities on your classroom webpage. Use this site to differentiate for different student levels. The Texas Performance Standards Project (TPSP) is a resource for providing differentiated instruction to gifted/talented (G/T) students. It is also a resource for providing enrichment for any and all students. The site includes materials for grade levels K-12 sorted by grade bands. Each band through 10th grade provides two or more interdisciplinary units including guided instruction as well as opportunity for independent research. The high school (or exit level) band provides for independent study under the guidance of a mentor who is an expert in the student's area of study. All materials are aligned to Texas Essential Knowledge and Skills (TEKS) standards. Use this site to meet the needs of your gifted students. Use guides and materials to differentiate instruction in your classroom. Share with other teachers as a resource for collaboration with students across classrooms. Don't miss this incredible wealth of math information! Find activities divided up by grade level, including instructional videos. Use the instructional videos to learn the skills required for each practice. Choose Kindergarten through sixth grade by clicking the Practice button. Then, pick a particular skill at that grade level. Each skill (such as Addition, Subtraction, Time, Fractions, Measures, etc.) has multiple practice activities that are rated by difficulty with stars. Increase the difficulty by starting with one-star items and working towards the five-star items. Click on instructional video if you get stuck to view a screencast video of how to solve the problems. These videos are hosted on YouTube. If your district blocks YouTube, the videos may not be viewable. You could always view the videos at home and bring them to class "on a stick" to share. Use a tool such as Tube Offline, reviewed here, to download the videos from YouTube. Bookmark and save this tool for use throughout the school year when teaching and practicing math lessons. Share this tool on your class website for students to practice math skills. View Instructional Videos together on your interactive whiteboard or projector to show how to solve the Math problems. Students can work on Math skills independently, working from the easy skills to more challenging ones. This is an excellent site to use to differentiate your math class. Offer your gifted students the opportunity to work on new skills. Your learning support students can use this tool to review skills not yet mastered. This is a perfect addition to your 1-1/BYOD classroom. Use this site with or without creating a login. Consider pairing students who excel at math skills with those who struggle. This fabulous UK site offers many resources for math practice and instruction. Choose the Videos and Worksheets section to find a large list of topics sorted alphabetically including instructional videos and practice questions. Many also include corresponding textbook exercises. Choose 5-a-day to find another large selection of printables for daily review, choose from three different levels for each date. (U.S. users will need to "translate" the 5-a-day letter equivalents to find approximate grade levels; count backwards from grade 12 being "A.") Conundrums for each day of the year provide short, daily brainteasers ready to print and use. Don't miss the Great Maths Bakeoff, a terrific idea for Pi Day! This site was created in the UK. American English speakers will notice slight spelling differences and use of English currency. There is also mention of Key Stages 3, 4, and 5. In America, these stages equate to Ages 11-14 (Stage 3), Ages 14-16 (Stage 4), and Ages 16-18 (Stage 5). Some of the videos are hosted on YouTube. If your district blocks YouTube, the videos may not be viewable. You could always view the videos at home and bring them to class "on a stick" to share. Use a tool such as Online-Convert, reviewed here, to download the videos from YouTube. Use printables and worksheets from Corbettmath for homework, review, and reinforcement of any math concept. View videos together and have students complete practice questions. Create a link to YouTube videos on your class website or blog for students to view at home. Use this site to differentiate for students of all levels. Share this site as a way to review before tests. Worksheet Genius offers an extensive choices of worksheets content and options to custom create your own. Begin by choosing a topic such as English, math, or word lists to view options. Find various topics such as spelling practice (UK spelling! ), thermometers/temperatures, math operations, and grammar. Most topics include several options for worksheets, including one to design your own. Once your worksheet is complete, select print. Your worksheet will print in PDF format. Having problems printing? Read the Print Tips in the bottom left red box. In addition to worksheets, Worksheet Genius provides a large selection of clipart free for use in educational settings. This site was created in the United Kingdom. You may notice some slight spelling differences in the instructions. This worksheet tool offers many customization options, so it is easy to differentiate for ability levels within your class. Use worksheets from Worksheet Genius in learning centers. You can also make a touchable center by sharing them as a center on an interactive whiteboard. Share a link on your class website or newsletter for parents to use at home. Use Worksheet Generator for review before quizzes and tests. Visit English Worksheet Land anytime you need an activity for Kindergarten through fifth grade English language learning. Select Common Core aligned curriculum from the menu bar at the top. Discover analogies to vocabulary and everything thing in between (with accompanying answer keys). Find PDF downloadable worksheets by grade level or alphabetical topics. Sign up and receive their weekly New ELA worksheet via email. Why reinvent the wheel? Bookmark this site for use all year. Use these worksheets to help differentiate for students. Many of the topics are covered at different levels and with different activities. Use some of the worksheets as review of a topic you already taught or to prepare for a test. Set up stations with worksheets from different topics for different days of the week, i.e. Monday is always spelling day and Friday is always poetry day. Choose individualized options so students are working at the appropriate level. These worksheets would be great practice for ESL/ELL and learning support students. Hate worksheets? Have students access this site and create their own learning activities to challenge each other based on the content here, but adding their own creative touches. They could use a quiz creator or multimedia tool from the Edge. Create "free and easy" interactive polls/quizzes using Kahoot (reviewed here). Beyond Traditional Math is an interesting blog written by a fourth-grade teacher who was "appalled to be handed a math book in which all instruction was whole group." This inspired her mission to move beyond the traditional classroom model for teaching math. Informative articles discuss building strong classroom cultures through standards, writing clear learning targets, and discussions on classroom activities. Explore this blog to find many lesson ideas along with practical classroom tips for use throughout the year. The ideas are adaptable across several grade levels. Click on tags at the bottom of each blog post to find archives of posts about similar topics. Subscribe to this blog through email or follow on Facebook and Twitter to receive notification of blog updates. Use blog posts during professional development or brainstorming sessions to find and develop classroom lessons. Try these ideas to differentiate for all students. Click on the Common Core tag to see a strategy to get students to start showing their work! Share student-made math projects using Ourboox, reviewed here. Ourboox creates beautiful page-flipping digital books in minutes, and you can embed video, music, animation, games, maps and more. Mathwiki is a collaborative, open access math textbook for higher level math. The wiki is constantly updated by university faculty and students to offer an ever-growing resource. Its purpose is to be a supplement to traditional textbooks. Choose the "Mathematics" icon to begin. Choose from several categories such as Algebra or Geometry to continue. Narrow choices within each group to find information by topic. When looking for specific content, use the search bar to find all relevant information. Some content areas contain more information than others. Provide a link to MathWiki on your class website or blog for student use at home. Share information from the wiki on your interactive whiteboard (or projector) to supplement current learning materials. Use the wiki to find questions and student problems for classroom use. Differentiate learning for gifted students using content provided on the wiki. Maths Is Good For You offers a history of mathematics and loads of math activities for young mathematicians. Although the site isn't very visually pleasing, it contains quite a bit of mathematics background and information. Learn about famous mathematicians, famous places in math, and the background on some of the origins of mathematics. Be sure to check out the worksheets section for some interesting and quirky activities. This site was created in the UK. American English speakers may notice slight spelling differences. There is also mention of Key Stage 3, 4, and 5. In America, these stages equate to Ages 11-14 (Stage 3), Ages 14-16 (Stage 4), and Ages 16-18 (Stage 5). Use Maths Is Good For You as a starting point for information on famous mathematicians and theories. Have students upload a photo they have taken and add voice bubbles to explain what they learned using a tool such as Superlame, reviewed here. Have students use Fakebook (reviewed here) to create a "fake" page similar in style to Facebook about a famous mathematician. Print and use worksheets for homework, math centers, or to differentiate instruction. Have students create interactive timelines using Sutori, reviewed here, with images, text, and collaboration and using timeline information found on this site. Engage your students and knockdown participation barriers with GoSoapBox, a free web-based student response system. Set up an event, or GoSoapBox space, for your class. Students enter the SoapBox through a unique code, and only the instructor can view the student names. Accessible through a computer or mobile device, GoSoapBox offers many tools for some creative Q&A in your classroom. The confusion barometer allows the teacher to assess the students' understanding of the topic. 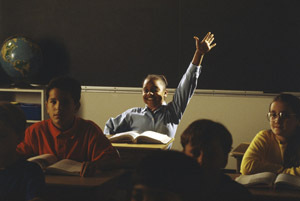 The poll and quiz tools provide a formative assessment option. Post questions or topics for your students using the GoSoapBox discussion tool. An option to post anonymously is available as well as many other settings for using the Social Q&A tool. Students can post questions for their peers or the teacher to answer. Coupled with an Internet connected device, GoSoapBox provides an outside the box classroom experience. GoSoapBox is free for class sizes under 30 students. GoSoapBox provides an opportunity for instructors to think outside the box for greater student engagement and participation. Is your classroom BYOD? Use GoSoapBox for free! Use the polling feature to access prior knowledge, or use it as an exit slip. Assign multiple choice quizzes as formative assessments throughout the class to differentiate instruction. Post questions and topics to foster higher-level thinking using the discussion tool. The Social Q&A tool allows students the opportunity to communicate and collaborate for understanding. Use the Social Q&A as a back channel during lectures or videos to make sure you address all student questions. Students can vote on the questions posted in the Social Q&A. Use this feature to address the most pressing needs of the class. GoSoapBox is a useful site to organize and collect meaningful data to make sure you are meeting all the needs of your learners. Try it during Back to School night as your school begins BYOD so parents can see the power of engaging EVERY learner. TeachingEnglish provides free classroom materials, lesson plans, and activities for teaching English from primary ages through adults. Explore free teacher professional development and training materials in addition to articles on the facets of teaching. Any group, whether ESL/ELL or not, can use the lessons and some of the interesting activities they have for learning vocabulary and engaging in conversation. At the bottom of the home page find a huge directory categorized by Teaching Resources, Tools for Teachers, Teacher Development, Teacher Training, Specialist areas, and more. Since the site is from the UK, the vocabulary and spelling used is British. You may want to complete some of the selections with a projector or your interactive whiteboard for the whole class. You could also differentiate by having small groups of students working on various activities at their individual independent levels. Make a shortcut to the activity on your classroom computer. Share a link to this resource on your class website or blog. Highlight and print (or view) only what you want from a web page using Printliminator. Downloading this tool is made easy with the drag and drop bookmarklet; Drage it to your browser's toolbar (Printliminator works with Chrome ONLY). Then click the bookmarklet from any page to open up tool options. Mouse over your web page and click on red boxes to remove them from the page. When ready, preview and send to your printer. Be sure to watch the Quick Slideshow Demo for a full overview of all features of the Printliminator. Install the Printliminator on your browser tool bar. Show students how to use Prinliminator on your interactive whiteboard or projector for use when they are researching or preparing a study guide for a test. Use when viewing web pages on your interactive whiteboard to eliminate unnecessary information. Delete unnecessary information from webpages. Send to print and save as PDF for use with student handouts or links from your class web page. Of course, you will want to include your SOURCE on the handouts as a model of good digital citizenship. This is also a great tool to differentiate for any student. Use this tool to share handouts or PDFs with students who are easily distracted to help them stay focused on what matters.